UPDATE: Registration is now live! 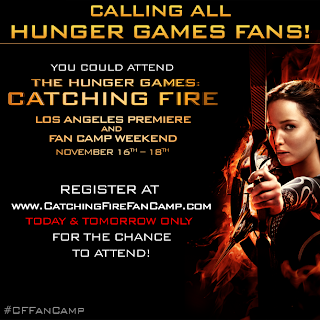 Head over to the site or the Facebook app to register for your chance to attend the Catching Fire LA premiere fan camp. There are approx. 1000 tickets available for the camp, taking place at the NOKIA plaza in Los Angeles. Successful fans will be notified by November 7th. Calling all US tributes! Want to attend the Catching Fire US premiere in Los Angeles on November 18th? Well now's your chance! Registration for a special Catching Fire fan camp will begin on Thursday, October 24th at 1PM ET / 10AM PT, lasting for 48 hours only. Check back at CatchingFireFanCamp.com on the 24th to register. The camp is set to start on the 16th, and run right up until the premiere on the 18th.